We provide effective solutions to water problems created by storm water runoff from excessive rain off roofs or driveways that can damage a property and its landscape. These problems can be corrected by the installation of channels for hardscapes, catch basins and grates for downspouts and low spots in the landscape and flow wells for subsurface drainage. 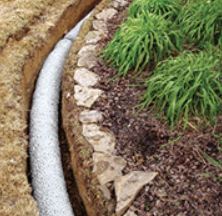 A French drain will help move water away from the house and yard. The French drain intercepts water before it reaches your house. It then acts as a gutter keeping your house or landscape dry. 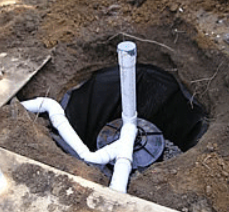 Water trapped in front of your garage or doorway can be trapped with a channel drain and diverted to a well in the ground or simply diverted to another location. Water from the runoff of roofs through downspouts or low spots in the landscape that collect water can be corrected with underground catch basins which will dissipate the water through the soil.